Let me start by stating that hair has never been a big issue with me. In my three decades (plus a few years), I’ve worn my hair every length, style, and a plethora of colors. Growing up, that was one area where my parents never chose to go to battle. Hair wasn’t important. Honesty, finishing what you started, and treating people the way you wished to be treated—those were battle worthy issues. Hair? No one cared about hair. Then I hit puberty…and discovered boys. I learned the boys whom I liked preferred long luscious locks on traditionally beautiful girls. Like so many, I wanted to be wanted. Like so many, I subscribed to the belief, that who I was, as an individual, was directly and essentially connected to what I looked like. I’ve distanced myself from that belief as I’ve aged. But I’d be lying if I said I don’t still have a difficult time completely letting go of it—the belief that my physical body and my self are one in the same. When the idea was proposed to shave heads in support of a young man in my life who is fighting leukemia, I have to admit, I hesitated in my personal commitment to the act. I’d always said I would shave my head if someone close to me might benefit from it. But when the opportunity arose, I felt the flush of insecurity and fear as it crept into my chest. The thing is, my hesitation, it wasn’t because I felt some kind of vain tether to my hair. I hesitated because I wasn’t sure my children would be comfortable being seen with a hairless momma. 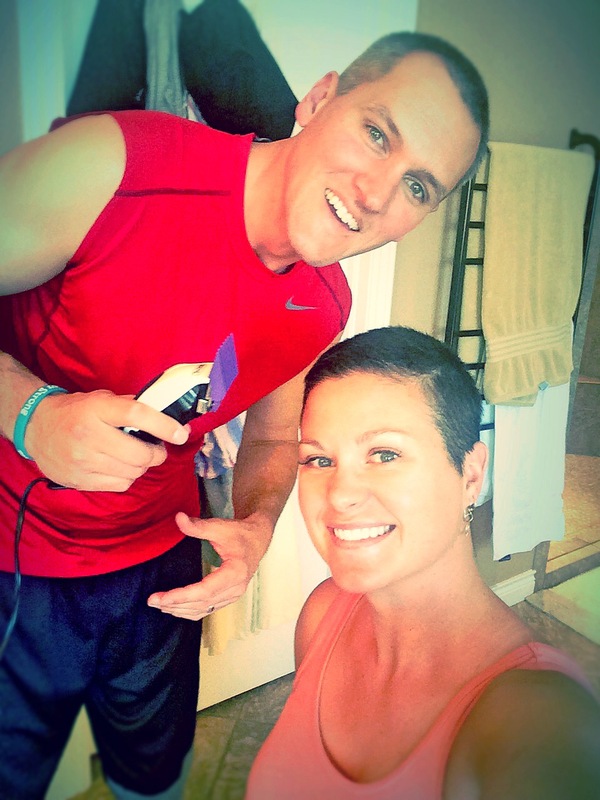 I hesitated because I feared my husband would be upset if I looked (even) less feminine. I hesitated because I wasn’t sure if a shaved head was part of who I was. Of course, as soon as I heard from that certain seven-year-old, and he said he thought it funny if I shaved my head, the deal was as good as done. Just like so many who shaved their heads in his honor, I would do virtually anything to ensure a smile, however brief, found its way to his sweet face. I did it in the hope of making him smile. I did it in the hope that through a simple act of solidarity with others I might create strength to help to heal a boy, his family, and all those who love them. I did it because it was something I could do. I did not do it knowing how much it would teach me. My hairlessness has been like an open invitation to people to question me why. While some are far more tactful than others, I don’t mind the curiousness. One of the reasons I decided to go through with the big sh ave was to create more opportunity to tell my young friend’s story and recruit more prayer warriors to take up his cause. While in a makeup shop in Vegas, a young woman said to me, “I don’t know if your haircut is by choice, or some other reason, but I just wanted to tell you, I think you’re beautiful.” I was flattered, of course, but more importantly, I felt like the door had been opened to share my reason why. She was moved to tears. I have every reason to believe she is still praying for the little boy from Wyoming. Lesson Number One: There are so many good people in this world. Lesson Number Two: We are all connected. I am proud of my daughters who (ages 9 & 7) decided to shave their heads to honor and support their friend. With their decision, I realized my worry about whether or not my children would feel self-conscious about my baldness was wasted energy. Hair, as it turns out, isn’t all that important at our house. My husband likes long hair on women. Much like the boys I mentioned earlier, he likes “traditionally beautiful”. He likes long hair. He likes curves. But what he really likes is…me—with hair or without it. My insecurities about femininity are deeply rooted, but they are mine. The one man who holds the opinion for which I am most concerned, he sees me far more clearly than I see myself. Lesson Number Three: Look for your reflection in the eyes of those who love you. It’s a far better measure of your beauty than anything you will find in a slate of one-dimensional glass. I have received many compliments about my hair…or lack thereof. Perhaps my revelations would be different had the existential experience of approval been different. I’ll never know. I do know…I am lucky to be alive—blessed to be given a place on this earth, in this time, with these people. And what I’m sure of now? Well, I know that sometimes, most times, when we let go of our fear and insecurity we are given something far greater in return. I know there are lessons to be learned in the strangest of places—unexpected gains to be made where we least expect them, and I know I’ll be rocking this new do for at least a little while longer. Trusting this guy with the clippers! This post is dedicated to all the brave men, women, and children who rock their beautiful bald heads as a result not of choice, but of being called to fight. May your battle be brief. May you be victorious. And may God be with you always—giving you strength and courage, and reminding you that love wins.